Certain seasonal fruits like Palm fruit or nungu (in tamil) are only found during summers. 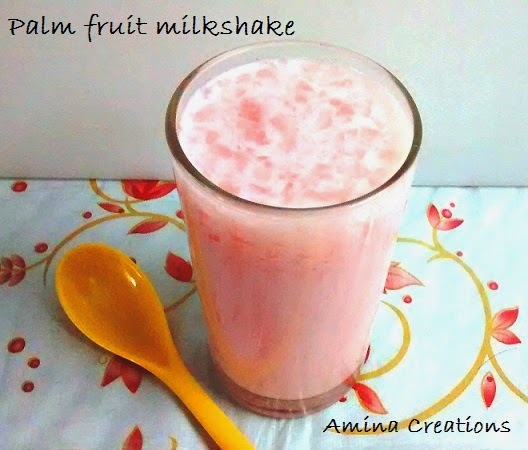 And if this fruit is available during the holy month of Ramadan, then it surely finds a place at the iftar table in the form of this delicious and refreshing milkshake. Take the palm fruits in a mixer jar and grind for a few seconds. Make sure that they are thinly sliced and not ground to a paste. Take milk in a jar. Add sugar and mix well with a spoon till the sugar dissolves. Add Roohafza and mix well. Finally add the palm fruits and mix well. Refrigerate for 3 to 4 hours, transfer to tall glasses and serve. Refreshing and delicious looking shake. Excellent pics as well.